You'd be forgiven for thinking that Alfie the stallion is chewing on a Barbie Doll. In fact, that mass of blond hair at the end of his nose is actually his moustache. And at an impressive seven inches long when unfurled it is, his owners believe, the longest in Britain. The shire cross certainly seems very happy with it. While most horses have their moustaches snipped every six months, his has been growing for five years and he is said to growl if stable hands try to give it a trim. 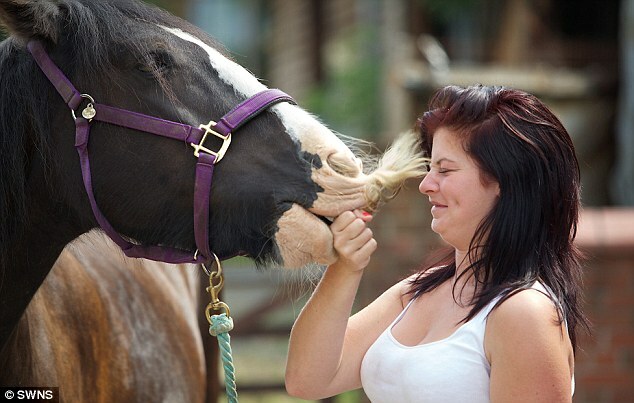 Alfie is kept at stables in Bitton, near Bristol, where stables manager Hayley Coxteth, 20, said: ‘He is a very headstrong horse and is very proud of his moustache. He is a real character. ‘A few years ago it was really big and full but it now looks a little scraggy because it’s so long. ‘It was bizarre when I first saw it and my first inkling was we need to shave it off. But he does not let you anywhere near it. You have to be very brave to try and tackle his curls. 'He is quite a shy horse and gets spooked easily but he can be the most gentle and fantastic ride. 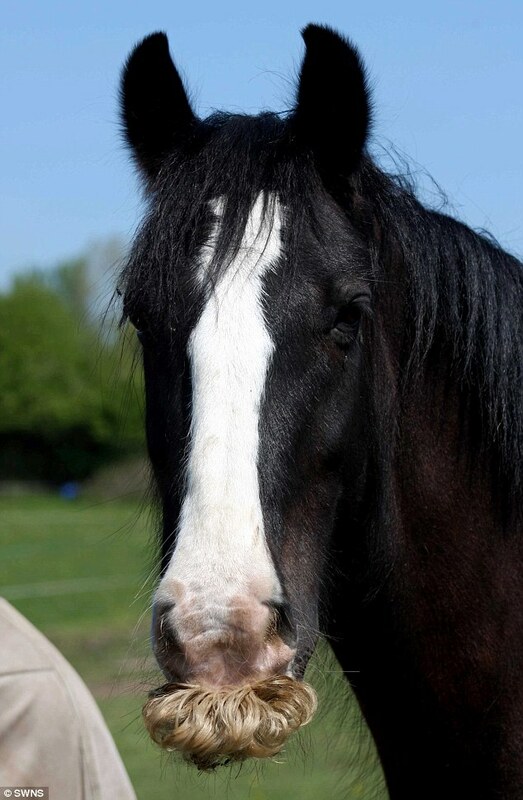 Horses have whiskers around the muzzle to help them judge the distance of food and other objects, but moustaches are usually seen only in Friesian breeds. 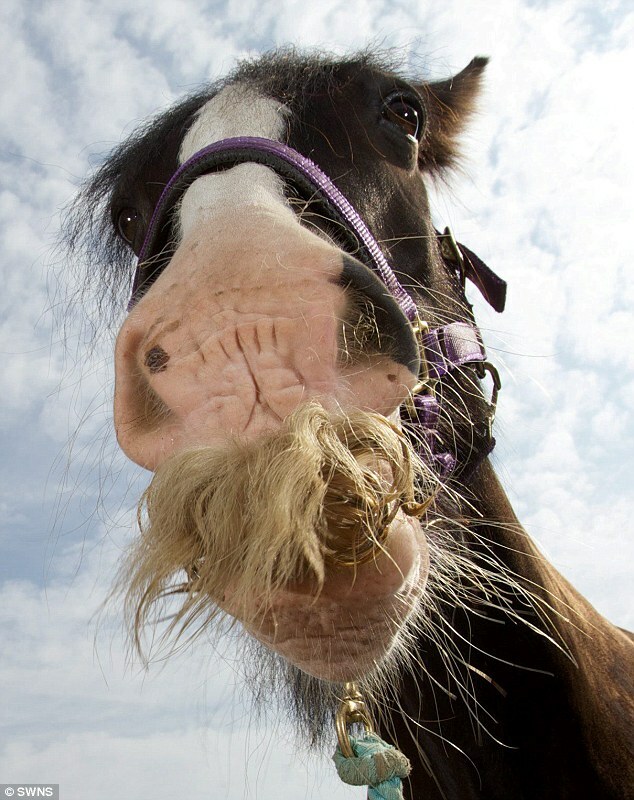 Dave Prince, from the British Horse Society, said: 'Whilst some horses do develop moustache-like hair growths, they don't tend to be anywhere near as long or thick as this and are usually higher up the muzzle.